Section 609 of the Federal Clean Air Act requires technicians who service motor vehicle air conditioning “MVAC” systems to be certified. Servicing motor vehicle air conditioning includes repairing, leak testing, and topping off of air conditioning systems low on refrigerant as well as any other repair to the vehicle which requires dismantling any part of the air conditioner. RSES is not a certifying organization for the Section 609, but we are able to bring it to you courtesy of ESCO Group. All documents provided in relation to preparation are provided below courtesy of ESCO. See below for your copy of the training packet or to take the test. Save time and take the test online! 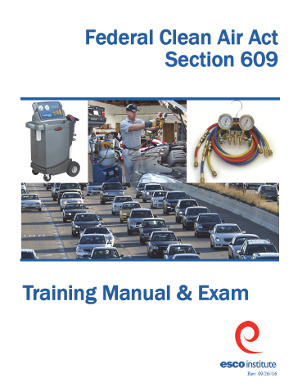 The 609 examination is an open book test that can be taken online for $20 with immediate results. Persons who pass the open book exam are awarded: a wallet ID card and a wall certificate. Click here to download a copy of the free study guide. Click here to take the exam now!